"Funeral of a Chinese Catholic woman 2"
Funeral of a Chinese Catholic woman as it passes on the street in front of the cathedral and the seminary; banner holders in front followed by musicians and next by family members in white garbs. Banner holders, musicians, grieving family members. 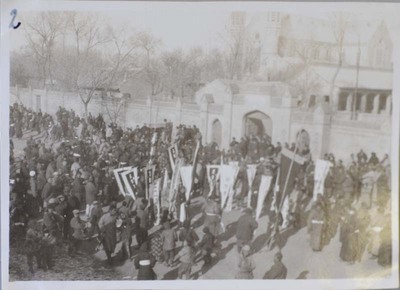 Funeral of a Chinese Catholic woman 2. 1932/1933. Société des Auxiliaires des Missions (SAM) China Photograph Collection, Whitworth University Library, Spokane.